This interesting and unusual surname, chiefly found in the Munster county of Cork, is an Anglicized form of the Old Gaelic "O'hAngluinn". 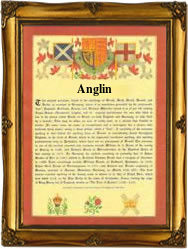 The Gaelic prefix "O" indicates "male descendant of", plus the personal byname Anglunn, from "anglonn", champion. Traditionally, Irish family names are taken from the heads of tribes, or some illustrious warrior, and are usually prefixed by "O" (as above), or "mac", son of. The surname first appears on record towards the end of the 15th Century. In the Elizabethian Fiants Records of the following century, early Anglicized forms of the name include: O'Hanglen, Anglyn, and also Angiant, Angyllant and Anglound. The latter two forms have led to confusion with the surname Angland which is widely found in north Cork, where it is a variant of the name England; Nicholas de Engelond (Cambridgeshire, 1260), being the earliest known namebearer from this source. On January 5th 1757, William Anglin and Sarah Crawley were married at St. James', Westminster, London, and on September 20th 1829, the marriage of Michael Anglin to Mary Rupell took place in Macroom. Co. Cork. The first recorded spelling of the family name is shown to be that of Fionn O'hAnghluinn, chief tympanist of Ireland, which was dated 1490, in the "Annals of the Four Masters", during the reign of King Henry V11 of England, known as "Henry Tudor", 1485 - 1509. Surnames became necessary when governments introduced personal taxation. In England this was known as Poll Tax. Throughout the centuries, surnames in every country have continued to "develop" often leading to astonishing variants of the original spelling.